The Flir E8 Ex-Series Thermal Imaging Camera is the top-of-the-line model in Flir’s revolutionary Ex-Series line-up. Boasting more than 76,000 pixels, this camera is able to produce stunning images that are crystal clear and highly detailed. 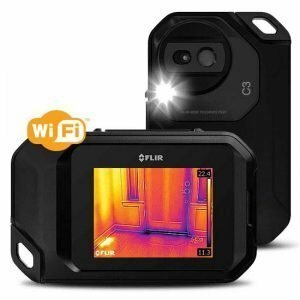 Suitable for a wide range of applications, the camera comes with the FLIR tools software program that provides access to image analysis features and report generators that are sure to impress clients and reflect favourably on your company. 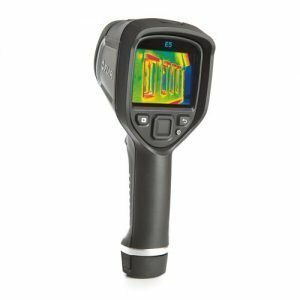 The Flir E8 Ex-Series Thermal Imaging Camera gives you instant insights into equipment and structures during inspections with its state-of-the-art MSX Thermal Image Enhancement abilities. While the infrared sensor shows heat signatures, the visual camera shows a real time image of whatever is in front of the lens. These two imaging solutions combine to give you a single picture with labels and numbers in all of the appropriate spots. Whenever high or low temperatures are detected, the Flir E8 Ex-Series Thermal Imaging Camera lets you know. The Colour Alarm alerts the operator that there is a possible issue present, helping to speed up inspections and ensuring that nothing critical is overlooked. 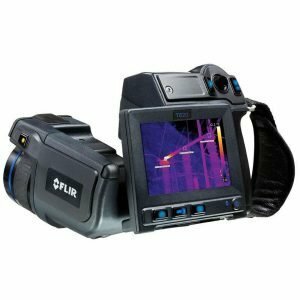 The Flir E8 Ex-Series Thermal Imaging Camera offers true one-button functionality and can be used with gloves. Just a touch of the button begins imaging with no focusing required, as the lens self-adjusts in response to conditions. On-screen menus make setting the camera for use simple, and you can save JPEG images with a tap for later review and sharing. Please click on the button to Download the Flir E8 Ex-Series Thermal Imaging Camera User Manual. Please bear in mind that you would need PDF reader to open the file.